Place the sugar in a medium pot with the cornstarch and salt. Stir until combined. Add 1/2 cup of milk and yolks, whip with a hand mixer until soft. Add the rest of the milk and whip constantly. Place the pot on the stove, let boil for 1 minute and mix constantly. Remove from the heat, add the chocolate chips so they melt along with the butter, keep mixing and add the vanilla extract last. Pour the pudding into 6 pastry cups. Cover the cups with plastic wrap, seal each and refrigerate for 3 hours. For the orange cream: Dissolve the cornstarch in 1/2 cup of yogurt. Place a small pot over medium heat and add the other 1/2 cup of yogurt, the orange zest, the orange juice, the yolk, sugar and a few drops of vanilla extract. Use a hand mixer to whip vigorously and let boil. Once it reaches boiling point, lower the temperature, keeping whipping and add the yogurt with the cornstarch. Remove from the heat once the mixture thickens. Place the mixture in a container, preferably metallic, to let it cool. Cover with plastic wrap, seal it well to prevent it from hardening or letting the surface dry. Once cool and thick, place one tablespoon of orange cream on top of each chocolate pudding and decorate with candied oranges, if you like. Decorate with peppermint leaves or candied oranges. You can prepare the pudding one day in advance and let refrigerate while well sealed with plastic wrap. The best recipes I've ever tried have come directly from my grandmother Eva’s tiny kitchen. I've always said that she is the inspiration for my culinary endeavors. As a good publicist, I've made it my job to promote and share her recipes. Speaking of which, I want to share one of her specialties with you: chocolate and orange cream pudding. My grandmother always said that orange and chocolate make the perfect pair. 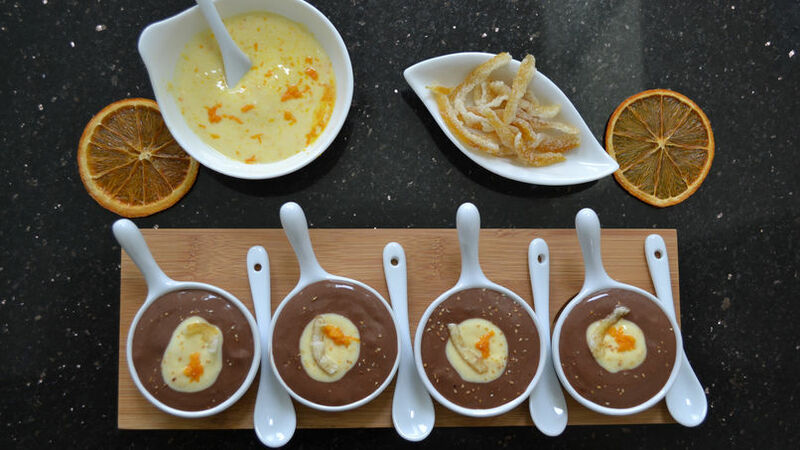 The chocolate pudding is silky and sweet while the yogurt based orange cream helps create the perfect harmony of flavors. Prepare this recipe at home to surprise your family and share a little bit of my grandmother's kitchen with them.